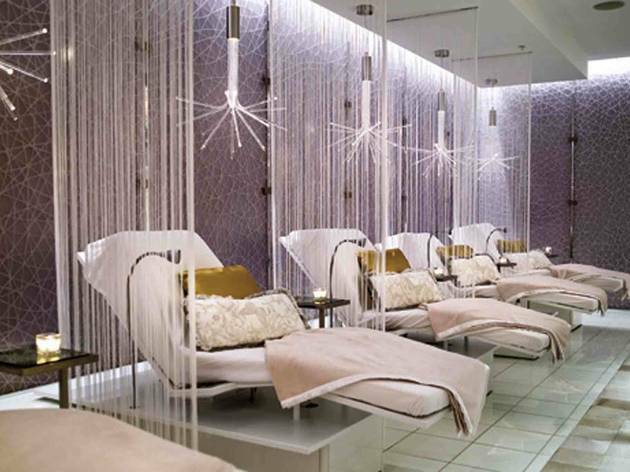 Put on the glitz at the Ritz-Carlton Spa at LA Live. 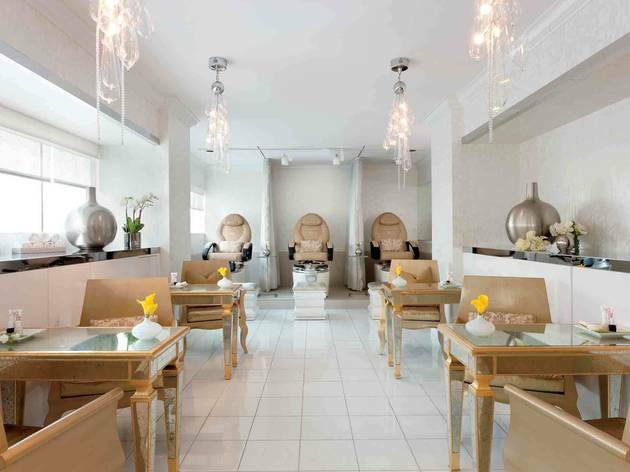 Enter the spa and you'll feel like you're in a swanky loft in the heart of the city. Upon entering the spa, you're greeted with a glass at Champagne or the beverage of the season—in spring it's the mint-lemonade, freshly made with lemons from the hotel's rooftop garden. Follow the “yellow-brick-road” that guide guests to the lockers, since the 8,000-square-foot hideout is a little tricky to navigate. Looked to get glammed up before heading out? 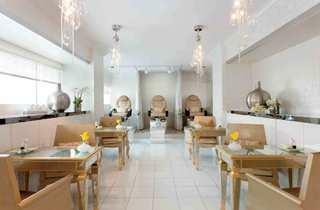 Popular signature treatments include Red Carpet Ready (3 hours and 30 min/$450), a 50-minute boozy Champagne and Shimmer body treatment (the shimmer in this being a crème infused with actual 24K gold) and Ageless Beauty facial, plus manicure, pedicure, hair styling and make-up application. Make sure to set aside enough time when visiting the spa—the men’s and women’s lockers include private relaxation areas, eucalyptus steam rooms and cold plunge showers. Once you’re ready for your treatment, leave some time to unwind in the co-ed Sanctuary where flat screens overhead are playing nature shots and the spread in the middle of the room surrounded by individual beds and reading lights, includes a selection of dried fruits, nuts and teas. 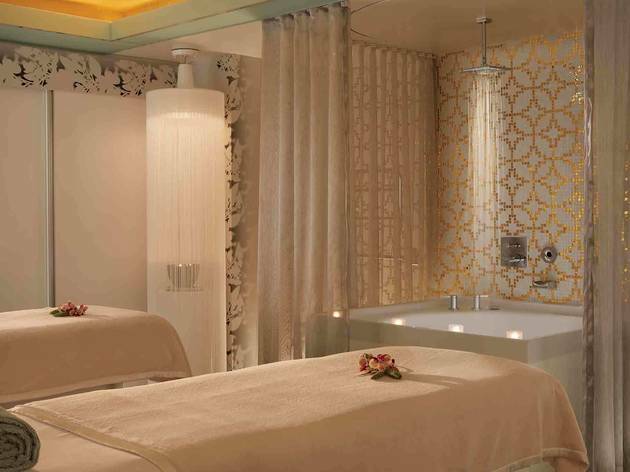 Experience seasonal treatments depending on what’s in season with the spa’s Garden to Glamorous treatments. In the spring, opt for the Lemondrop Body Treatment (50 min/$140 or 80 min/$200). Experience head-to-toe pampering using freshly picked products—the treatments incorporate herbs and produce from the hotel’s rooftop garden and match up top-of-the-line products to that season’s treatments. The Lemondrop is not to be missed—starting with that welcoming pour of mint-lemonade to the actual treatment of an exfoliating lemon-sugar scrub using fresh zest and followed by a Jurlique citrus mist and mini-massage using a blend of lemon crème and lemon-infused massage oil. Ask for Russell, who is highly requested and whose hands are strong and skilled enough to open those pesky shoulder knots. Following the treatment, which you’ll never want to end, sip on a special blend of lemon tea brought to you in a individualized glass teapot in the Sanctuary. The cherry—er, lemon—on top is the crumbly house-baked lemon butter cookie given to you at checkout to savory the treatment well after you’ve left the spa.